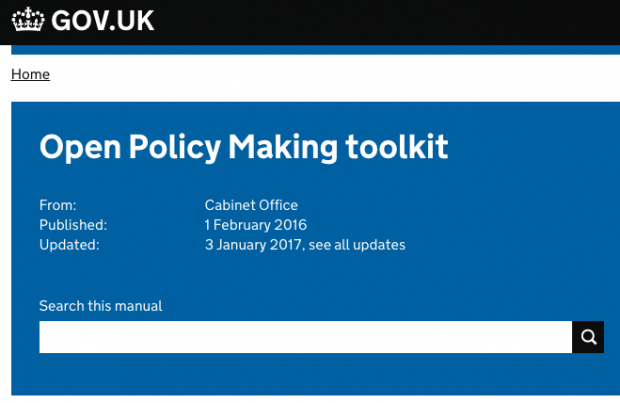 Vasant blogged a little while ago about refreshing the open policy making toolkit. Thanks to those of you who told us how you were using it - it’s great to see our tools and materials in so many contexts: from UK police forces to governments across the world. We love the toolkit, but we know there’s much more we could do with it. After a rather frantic few months, we’re reaching the end of the financial year and have a bit more breathing space. And we’re lucky enough to have a couple of friends keen to help out. The team will be working on a refresh over the next few months, firmly centred around what you, our users, need. They will be reaching out to many of you. We’d love to know what are the tools that might be most useful for you right now? What are the sorts of things you might need in the future? What’s the best way of learning how to use them? Are our written descriptions good enough? Would a short video help? Or is there just no substitute for attending a workshop and seeing the tools used in practice? We’d love to hear your views. If you want to take part, either by emailing us your ideas, or having a chat, tweet us @PolicyLabUK or email policylab@cabinetoffice.gov.uk.